Few westerners will ever be able to understand Muslim or Afghan society unless they are part of a Muslim family. Twenty years old and in love, Phyllis Chesler, a Jewish-American girl from Brooklyn, embarked on an adventure that has lasted for more than a half-century. In 1961, when she arrived in Kabul with her Afghan bridegroom, authorities took away her American passport. Chesler was now the property of her husband's family and had no rights of citizenship. Back in Afghanistan, her husband, a wealthy, westernized foreign college student with dreams of reforming his country, reverted to traditional and tribal customs. Chesler found herself unexpectedly trapped in a posh polygamous family, with no chance of escape. She fought against her seclusion and lack of freedom, her Afghan family's attempts to convert her from Judaism to Islam, and her husband's wish to permanently tie her to the country through childbirth. Drawing upon her personal diaries, Chesler recounts her ordeal, the nature of gender apartheid - and her longing to explore this beautiful, ancient, and exotic country and culture. Chesler nearly died there, but she managed to get out, returned to her studies in America and became an author and an ardent activist for women's rights throughout the world. Although I have listened to many books on Audible, this is my first review. 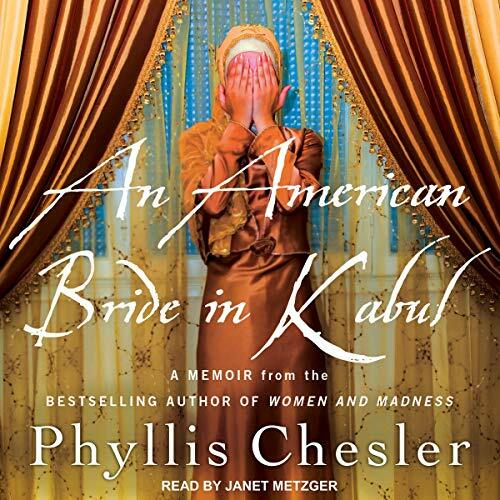 "An American Bride in Kabul" deserves accolades. I was looking for a book that addressed the issue of misogyny around the world, and Phyllis Chesler does a brilliant job of describing the situation of most women in the Middle East. She tells her very interesting personal story but also provides a rich history of the people, the customs, and the religion, all well-documented and never boring. I am looking forward to reading (listening to) her other books.